Heavy gauge zipper and bear-paw sized closure flap at the hood provide easy use and durability. Three-quarter length dual zipper expands venting options. Plump neck collar and draft tube seal in the heat. Generous cut and comfortable interior. While its 2.85 lb weight may not entice those looking to minimize weight, the Arete’s price point makes it a great value, especially for cold sleepers who don’t want to push the lower limits of the EN rating. 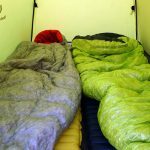 If carting around an extra three-quarters of a pound of sleeping bag instead of playing chicken with the comfort limits of your existing bag sounds like a reasonable tradeoff, the Arete should make your short list. Insulated with 650-fill down and sturdy fabrics, it’s still lighter and more compressible than a similarly rated synthetic bag. And it comes at a solid price. It will work well for anyone who pegs the warmth side of the warmth to weight ratio. 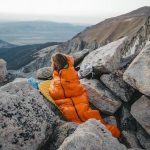 The design isn’t finely tuned, and cost savings are reflected in the Arete’s heavier, thicker fabrics, but it’s functional and doesn’t skimp on the effort to keep you comfortable when the mercury drops. Large baffles up the comfy factor while sealing in heat on below-freezing nights. For those who tend to be a bit rough with their gear, part of the Arete’s value will come from knowing you won’t be risking your investment every time you dish out a little abuse.